Walnut Street Group Holding Limited, the parent company of Chinese e-commerce startup Pinduoduo, filed for a $1 billion IPO on the NASDAQ or NYSE last Friday. Sources told China Entrepreneur that the company could fetch a $30 billion valuation. Pinduoduo’s profile is rising fast. It was founded in September 2015. And by April 2017, at barely 18 months old, it was already valued at $1.5 billion. Pinduoduo enables users to receive steep discounts on products if they invite enough friends to join them in buying. This feature has made it popular among budget shoppers in China, and it is scaling rapidly. According to the company’s SEC filing, Pinduoduo currently boasts 1 million merchants and 300 million active buyers. 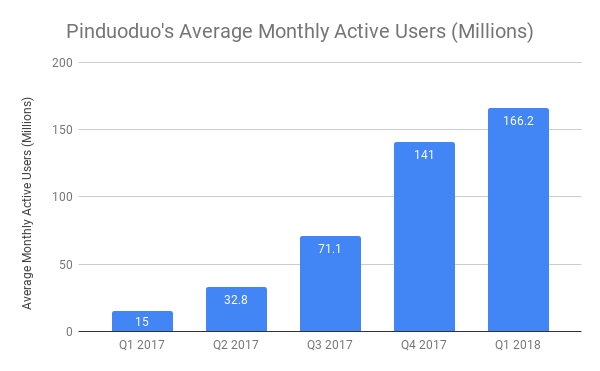 Pinduoduo’s average monthly active users soared from 15 million in the first quarter of 2017 to 166.2 million as of March 31, 2018. 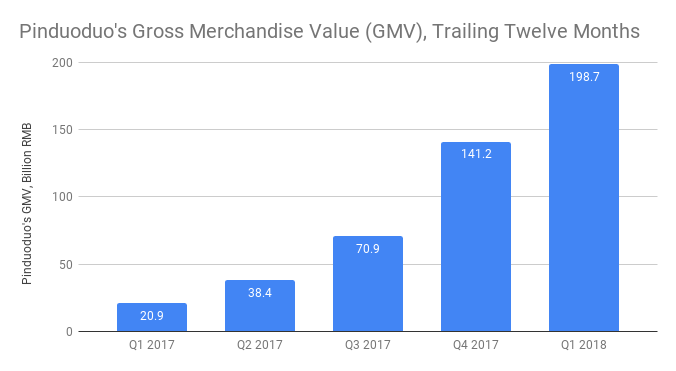 Pinduoduo’s gross merchandise value (GMV) rose from RMB 20.9 billion for the twelve months ending on March 31, 2017 to RMB 198.7 billion a year later. The company’s first quarter revenue ballooned from RMB 37 million in 2017 to RMB 1.38 billion ($220.7 million) in 2018. Pinduoduo was founded by Colin Huang, who began working at the headquarters of Google (NASDAQ:GOOGL) in 2004. Huang later moved back to China, where he helped set up Google China. He founded Ouku, an e-commerce company specializing in appliances and electronics, which he sold in 2010. In 2011 he founded Xinyoudi Studio, an online gaming startup. Huang is 38 years old, and currently serves as Pinduoduo’s chairman and chief executive officer. The company is moving towards profitability, with losses shrinking from 63.9% of total revenue in 2016 to 28.5% of revenue in 2017. Pinduoduo is backed by Tencent Holding (OTCMKTS:TCEHY), the Chinese tech company valued at $480 billion. Tencent owns WeChat, China’s dominant chat app with over a billion monthly active users. 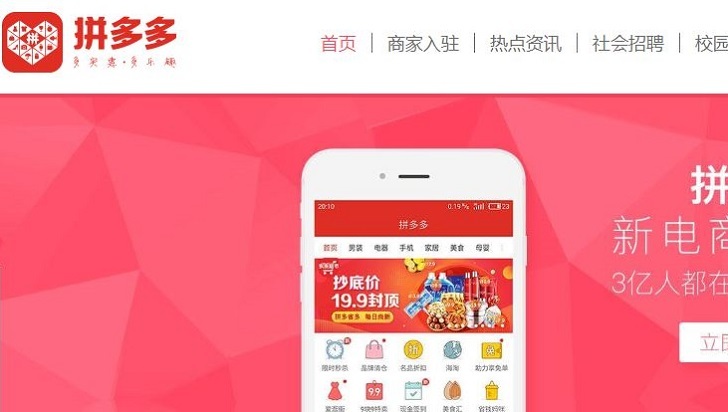 Pinduoduo’s partnership with WeChat has helped fuel its rapid growth over the past year. Tencent is the arch-enemy of Chinese e-commerce giant Alibaba Group Holding (NYSE:BABA). According to Crunchbase, Tencent first invested in Pinduoduo’s Series B in 2016. It led Pinduoduo’s Series C financing in 2017 and again invested in the company in April 2018. By investing in e-commerce startups like Pinduoduo and helping them scale, Tencent is attacking Alibaba’s core business. The two are also competing over payments in China: Alibaba’s Alipay accounted for 54% of mobile payments in China last year, with Tencent’s WeChat Pay holding a 40% market share. Competition is fierce; you cannot use Alipay on platforms Tencent owns and vice versa. Pinduoduo has a strong presence in smaller cities and rural areas in China. I recently discussed the threat Pinduoduo poses to Alibaba in greater detail. Pinduoduo is based in Shanghai. Credit Suisse, Goldman Sachs, and China International Capital Corporation are underwriting the sale. Article printed from InvestorPlace Media, https://investorplace.com/2018/07/chinese-e-commerce-startup-pinduoduo-files-for-1-billion-ipo/.